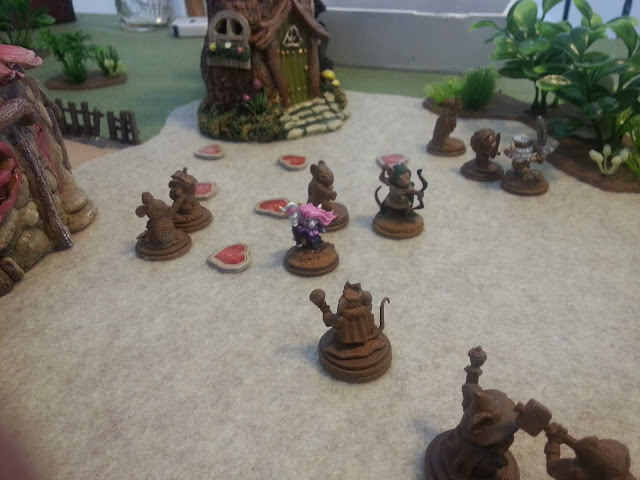 We had our first game of Burrows & Badgers yesterday - it's an awesome little game of anthropomorphic animals, set in a psuedo-historical fantasy realm. 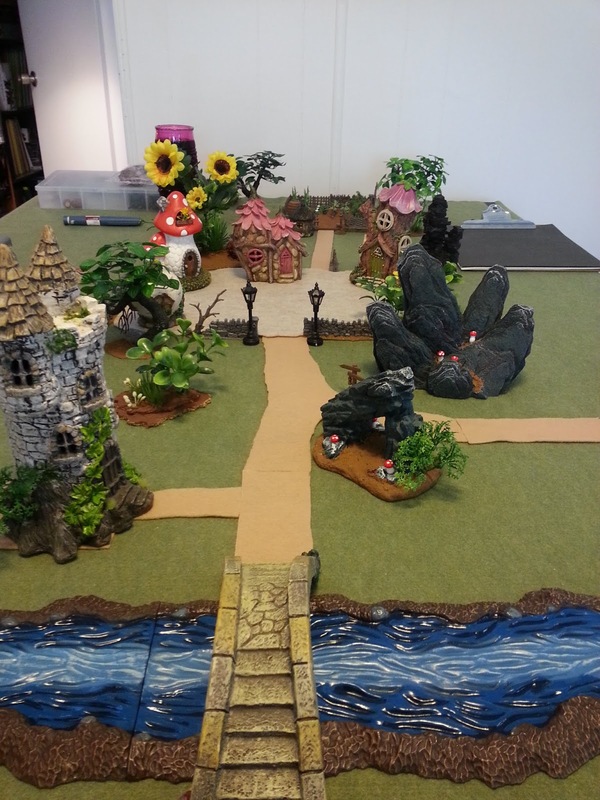 Its gaming roots are obviously solidly based in games like Mordheim and Necromunda, but it has far surpassed its forebears. I hadn't planned on embarking on a new game, but I was looking at my options after receiving an Amazon gift card about two weeks ago. 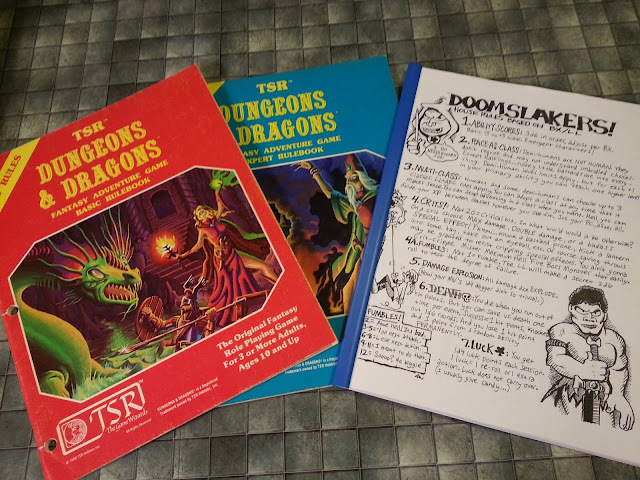 I saw the game book and did some research. Although I like anthropomorphic animals (thanks to Brian Jacques, and probably more than a little to J. M. Barrie!) I haven't dug any more deeply into playing a game based on them than purchasing the Mouse Guard rule book last year. But after watching a flip-through of the Burrows & Badgers rule book on YouTube, I was hooked. What I saw of the rules instantly sold me on the game! The Northlands have long been plagued by raiders, and scouts warned that Lord Vulgis Snar, master of Snarsden, was leading his marauding "Rat Bastards" toward peaceful Flowerbottom. Word was sent to Ivy Briarpatch, mouse-witch, leader of the nearest band of Briarpatch Wardens, the Guardians of the Glade. 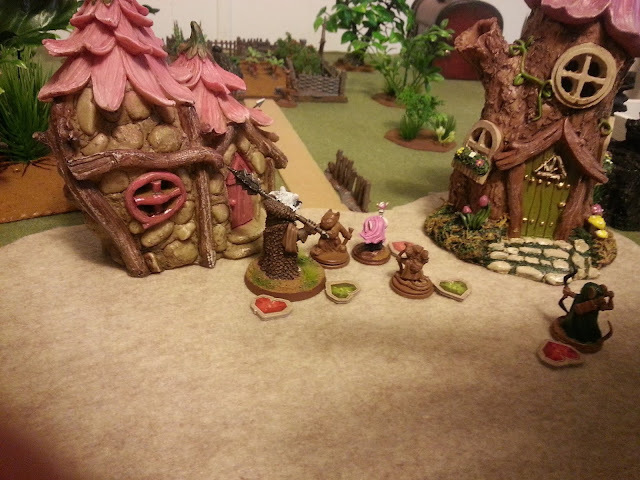 Knowing that the Guardians would be hopelessly outmatched by the badger lord and his brown rats, a call went out to all corners of the county for assistance. 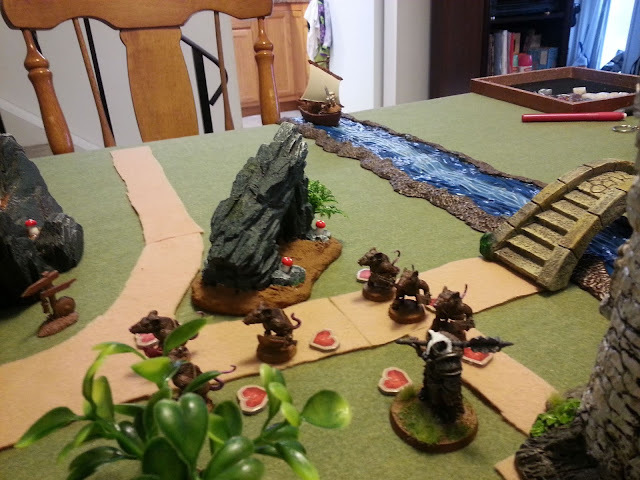 As the band of rat raiders advanced up the River Road, the Guardians stood their ground. Ivy and her second-in-command, her sister, Violet, as well as one of the young twins, their younger brother, Thistle, pelted the advancing raiders with arrows and spells. The other twin, Thorne, darted forward to hide behind the village wall - hoping to ambush any rat that came close enough. Middle sister, Cornflower, stood at the ready, mace and spell prepared, her steady voice calming the younglings and her elder sisters alike. The Rat Bastards seemed undaunted by the withering hail of arrows and magic. 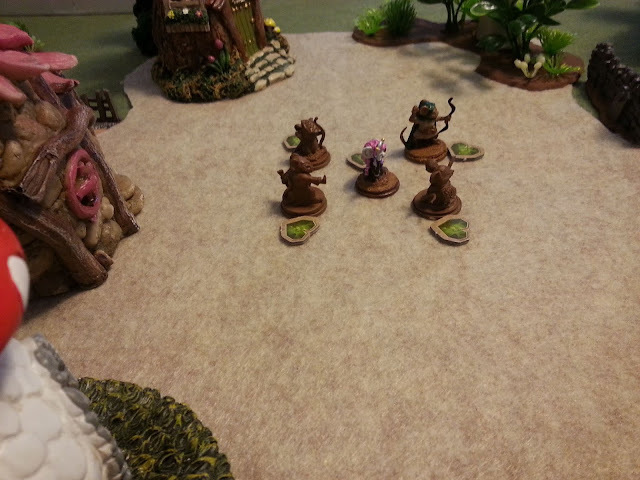 As they continued their advance, the defenders feared a close combat was inevitable. Suddenly, a cry went up from a nearby scout: a sail on the river! The cry was answered by the call of a northern horn, sounding the approach of a new force: a band of Wildbeast warriors in a small ship, a fierce barbarian standing on the her prow, his long white mane blowing in the wind! "We come from the land of ice and snow, from the midnight sun where the hot springs flow..."
Who were these northmice? Were they allies of Lord Snar, himself a Wildbeast of the north? Or had they heard the call for help and come to lend their steel to the fight? The answer soon came, as the force disembarked and charged into the fray, the white-haired warrior sprinting straight for Lord Snar, exclaiming that his band would dine on badger meat that evening! Lord Snar disregarded the bellowing northmouse and disappeared into the woods, leaving his rats at the bridge to do battle with the barbarian and his female companion. The village defenders continued to throw spell and arrow at the raiders. 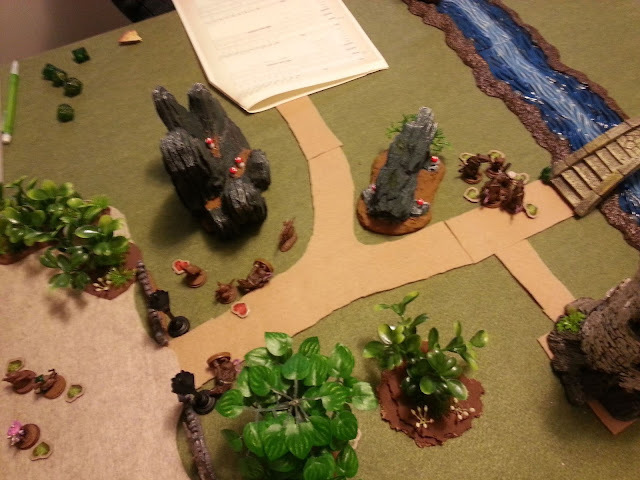 Little Thorne spotted a pair of figures in the shadows behind Crossroads Rock and dashed out to challenge them, only to find that they were ranging ahead of the northmouse, and were here to assist the defenders. Another rat lurked in the woods nearby, fearing to endanger his life by stepping into the road. The battle was fully joined, but the defenders were spread out and none could say where the massive badger lord had gone. 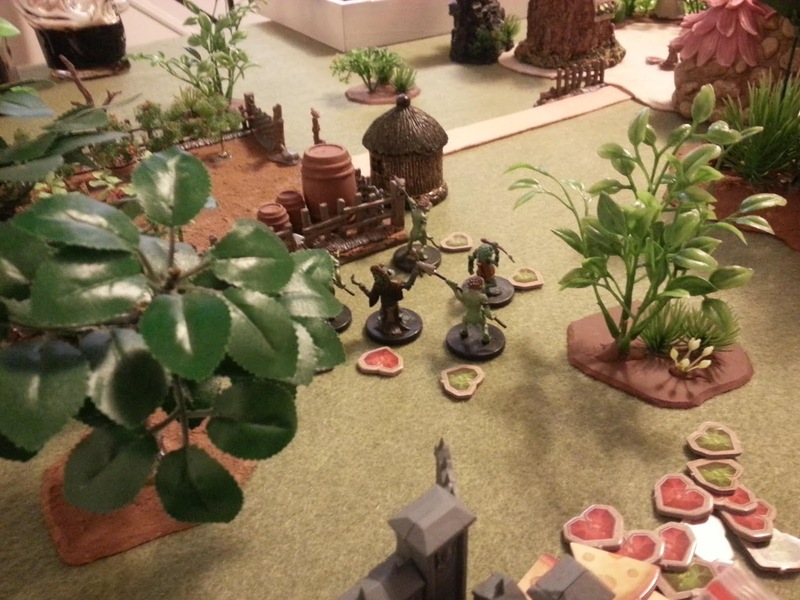 In the midst of this confusion, the scout let out another cry: a force had emerged from the forests near the garden to the rear of the defenders - a contingent of spear-armed frogs! ...when a new threat emerges from the south! It was instantly apparent which side the frogs were on, as their wizard unleashed a torrent of vampiric magic on poor little Thsitle. 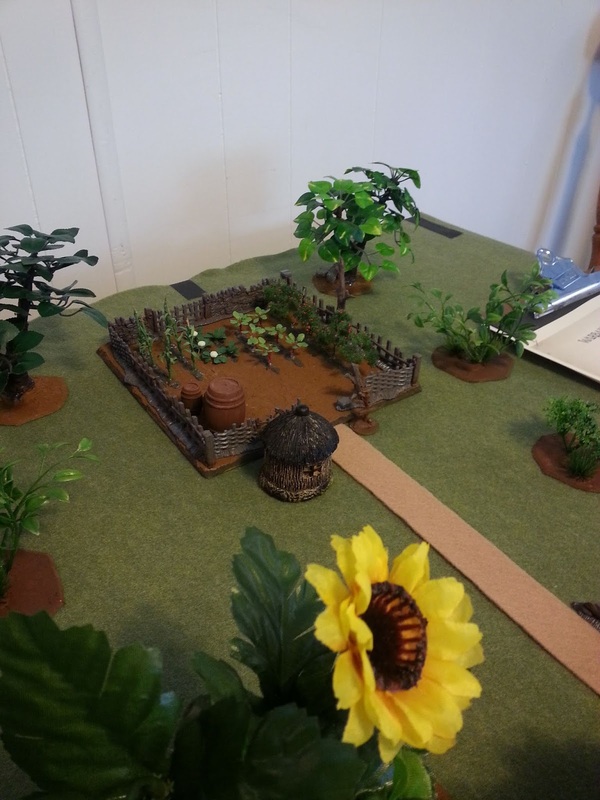 Now, things appeared absolutely dire for the defenders, as the forces closed on Flowerbottom while the barbarians were being held up by the rats to the north of the crossroads, too far away to help. How could things be worse? Cornflower stands her ground against the badger's fearsome charge! But stalwart Cornflower, Ivy's younger sister, the matronly member of the family, stood her ground against the badger's charge, showing no fear despite his bellowing onslaught. She simply turned and commanded him to halt. When he flew into a slavering rage and swung his massive maul at her, she expertly blocked the blow with her simple mace. His surprise attack (far too calmly) thwarted, Lord Snar suddenly found himself in a very bad position. The frogs were too far away to aid him (and taking their own sweet time getting any closer) and he was about to be swarmed by the entire mouse clan. 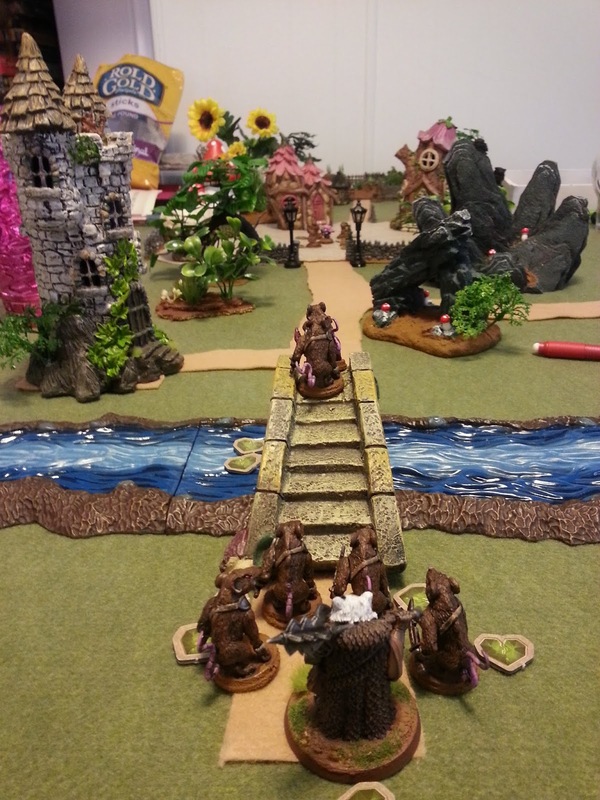 To make matters worse, the white-maned northmouse, Grim the Barbarian (who seemed to have some sort of grudge against the badger) had broken away from the rats at the bridge and was charging into the village. 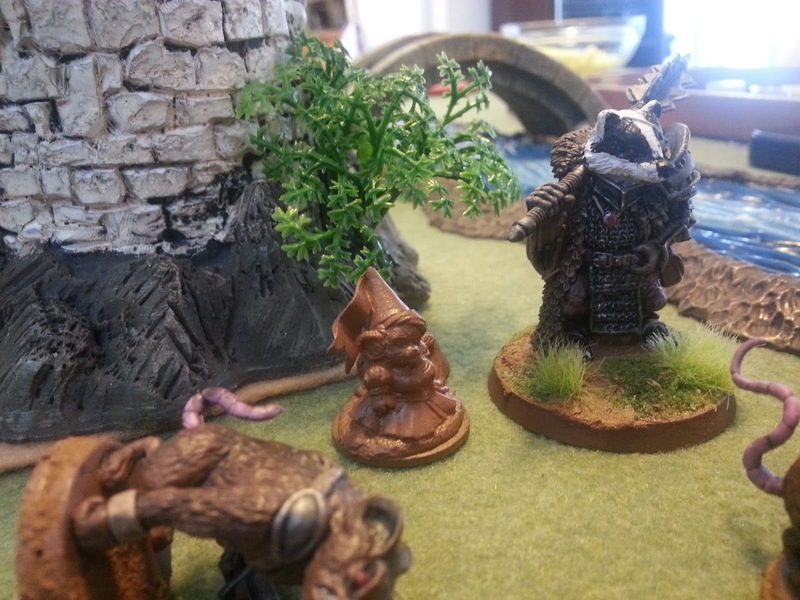 Lord Snar hoped for a moment that the rat defender the barbarian had broken from, who was close on the warrior's heals, might catch and stop him. But young Thistle crushed that hope as he spun away from the badger to face the advancing warrior, took a breathe, and loosed his bow. The slim bodkin arrow slipped close past the barbarian's head and pierced the heart of his rat pursuer, dropping him instantly. Victory - or is it? But the celebration was short-lived, as Lord Briarpatch burst into the square, exclaiming: "My Lucillia - she's gone!" The Lord and his daughter had been safely locked in their tower on the river, watching the battle from the ramparts. He told how, during the battle, he had turned to look at his daughter - but can only remember seeing a giant pair of mesmerizing eyes. When he recovered from his stupor, his daughter was missing. "Where could she have gone?!" Where has Lady Lucillia gone? Lord Briarpatch pleaded with Ivy: "Please, oh, please - you must find my Lucillia!" In the end, it was a fun game. I opted to forego the game's default head-to-head setup and play it as a gamemaster-run event. Which really just meant that I slightly customized the book's first scenario and ran my warband as a single large group with a points value to match that of the other players' warbands combined. Our third gamer, a lover of deeply immersive role playing, was thrilled by it. The rules have a simple way of allowing for weaker creatures to overcome powerful foes, or for moments of heroism (on both sides!) to come out, making for a great story. Add to that the depth that the post-game rules bring, and you've got a game that leads to a lot emergent story and character depth that most tabletop miniatures games lack. 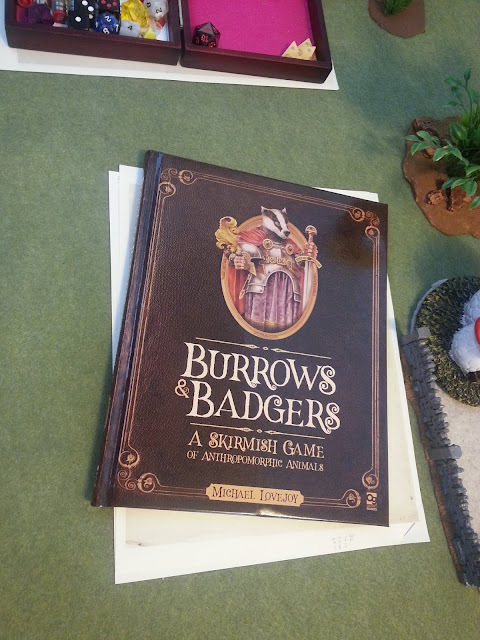 I'd heartily recommend Burrows & Badgers to anyone who likes to mix tabletop and role playing. You can bring as much story as you like to it, and the game's background is light enough and its rules simple enough that you can easily customize both to suit your tastes. Plus, it's a medieval-based fantasy game featuring anthropomorphic animals... 'nuff said! First off: this is fantastic. Mordheim is one of my "all-time-faves" AND (in addition) I, too, have a soft spot for the anthropomorphic animals. But even if this wasn't the case...wow! What fantastic set pieces you have here! Your scenery is beautiful and picturesque...is this stuff you just had lying around? Or is this standard for the bunnies and burrows game? 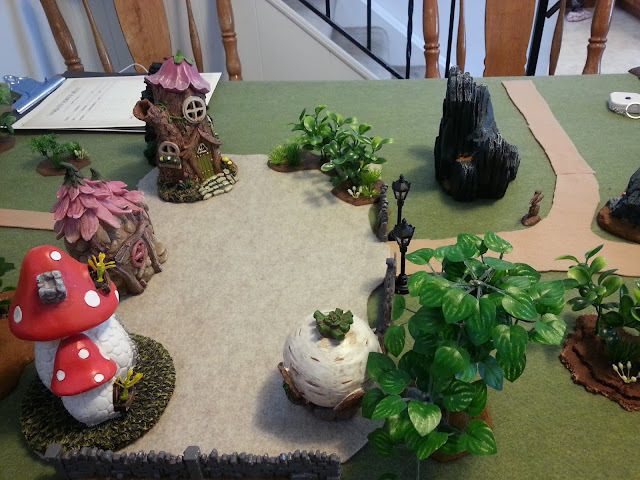 I have a lot of set pieces myself (was a big WH40K guy back in the day), but had none of this fairytale garden/toadstool house stuff (it's all ruined buildings and wasteland stuff). Where did you get it? Very nice review. Would like to hear more about how the rules trump its "forebears" (as I'm a rules guy)...however, I'll be sure to check it out! Super enjoyed that read! Great set pieces. Never even heard of this game but looks (and reads) like it is worth checking out. Got to this blog from somewhere else (another blog maybe?) and have kept the tab open for far too long (maybe a couple of months now) in an effort to follow some of your adventures. Thanx for sharing. As for the rules' improvements on their ancestors, two rules stand out as being more role playing inspired: First, a "Perfect Roll" rule that gives even the weakest combatants a chance to deliver telling blows to (or at least stand up to) larger opponents. This is what allowed possibly the most heroic moment of the game, when not only did Cornflower stand her ground against Snar's "Fearsome" trait, but deftly blocked his attack. We all expected at least a couple mice to fall to the badger, but thanks to two Perfect Rolls, a memorable event occurred. Second, the game has Fate Points - giving heroes and villains alike a little control over their destiny is a massive improvement over the games of the past. A few other things add depth to the game that Mordheim and Necromunda lack, such as: a broader selection of skills, options to add improvements to the warbands' dens (their homes) that provide in-game benefits, and the option to send the characters off to find work/adventure between games (in a manner that reminds me of Warhammer Quest's between-game rules). It really takes the solid framework laid down by those older games and goes one step farther toward character and story development. If you're still into that style of game and love anthropomorphic animals, you should definitely check it out! Right on, man...thanks for the info. I’ll be looking fo a copy. @Brooks: Thanks - glad you liked it! Sorry I'm not posting as frequently as I once did, but thanks for reading along!